In order to accurately communicate the colours we see, we need a reference or notation system with the ability to pinpoint precise colour. Six Elementary Colours are the basis for the Natural Colour System. These are White, Black, Yellow, Red, Blue and Green. 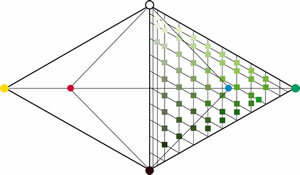 The colours are shown below on the three dimensional model called the NCS Colour Solid. Every colour in the Natural Colour System is contained within the NCS Colour Solid, and can be described in terms of the six Elementary Colours. In order to more easily pinpoint colours within the NCS Colour Solid, the NCS Colour Circle and NCS Colour Triangle are used. The NCS Colour Circle is a horizontal slice through the NCS Colour Solid, and shows a progression from Yellow to Red to Blue to Green and back round to Yellow in 10% steps. 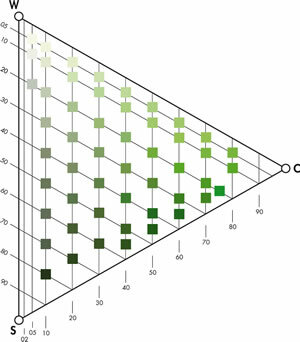 All the colours in the NCS System have a percentage of Whiteness or Blackness, and this is best illustrated using the NCS Colour Triangle. The NCS Colour Triangle is a vertical slice through the NCS Colour Solid. C stands for maximum colour intensity or Chromaticness, W stands for White and S for Black. The scales for Chromaticness, Whiteness and Blackness are each divided into one hundred parts which can be interpreted as percentages. The NCS Colour Triangle and the NCS Colour Circle are used to pinpoint colours within the NCS System. 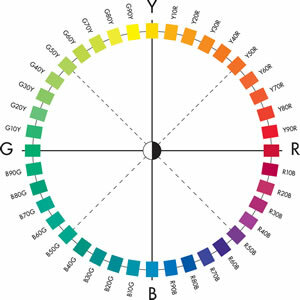 The diagram below pinpoints a colour with 30% Blackness and 20% Chromaticness, with a location on the NCS Colour Circle of G30Y. 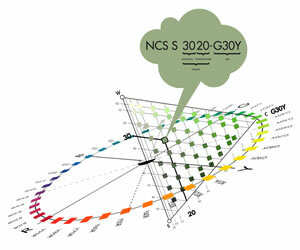 The complete NCS Colour Notation is S 3020-G30Y. Using the NCS Colour Notation it is easy to define the appearance of a colour. In the notation below 3020 indicates the Nuance of the colour. The Nuance describes the relationship of the colour to Black (S) and to maximum colour intensity or Chromaticness (C). The Whiteness is determined as 50%, as the sum of the values of the three attributes (Chromaticness, Whiteness and Blackness) must always be 100%. The Hue, G30Y, describes the relationship of the colour to the Chromatic Elementary Colours, in this case G and Y. G30Y means Green with 30% Yellow. The letter S preceding the NCS notation means that the colour is from NCS Edition 2. Achromatic colours (Black, White and Grey) lack Hue and are only given Nuance notations, followed by -N for neutral. S 0500-N is White and is followed by S 1000-N, S 1500-N, S 2000-N and so on to S 9000-N, which is Black. Please e-mail with questions or comments.